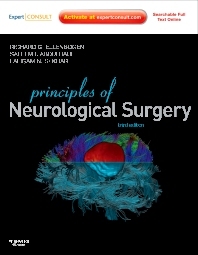 Principles of Neurological Surgery, by Drs. Richard G. Ellenbogen, Saleem I. Abdulrauf and Laligam N. Sekhar, provides a broad overview of neurosurgery ideal for anyone considering or training in this specialty. From general principles to specific techniques, it equips you with the perspectives and skills you need to succeed. Comprehensive without being encyclopedic, this new edition familiarizes you with the latest advances in the field, including neuroimaging, the medical and surgical treatment of epilepsy, minimally invasive techniques, and new techniques in position and incisions. No other source does such an effective job of preparing you for this challenging field! Get comprehensive coverage of neurosurgery, including pre- and post- operative patient care, neuroradiology, pediatric neurosurgery, neurovascular surgery, trauma surgery, spine surgery, oncology, pituitary adenomas, cranial base neurosurgery, image-guided neurosurgery, treatment of pain, epilepsy surgery, and much more. Gain a clear visual understanding from over 1,200 outstanding illustrations—half in full color—including many superb clinical and operative photographs, surgical line drawings, and at-a-glance tables. Apply best practices in neuroimaging techniques, minimally invasive surgery, epilepsy surgery, and pediatric neurosurgery. Geoffrey Appelboom, Matthew Piazza, E. Sander Connolly, Jr.
25 Intradural Extramedullary and Intramedullary Spinal Cord Tumors.